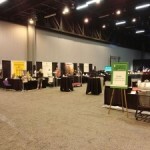 Southeastern Convention Services is in the tradeshow, convention, conference, and exposition decorating industry. 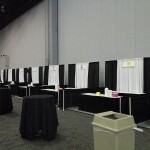 As a full service convention contractor that includes the complete setup and takedown of various pipe and drape, skirted and un-skirted tables, chairs, carpet, staging backdrop, stage stairs, clothing racks, signs, entrance displays, registration booths, modular displays, pop-up displays, and more inside various conventions and civic centers throughout the Southeastern United States. 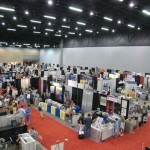 Other services that are provided by Southeastern Convention Services include complete material and shipment handling for exhibitors and tradeshow organizers. 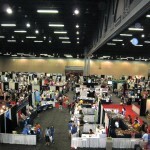 Shipment handling involves receiving all sizes of shipments and drayage either at our warehouse for transport to the show facility or receive the shipments at the show facility for storage and delivery to exhibitors or show organizer(s). 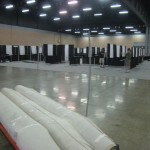 As trade show decorating and service contractors we also provide labor and rigging services. 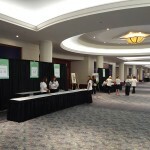 The labor is used for anything from convention booth setup to assisting trade show organizers with their own setup. 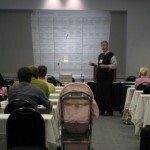 If you are looking for an Atlanta [main_service] contractor, please call 770-713-6261 or complete our online request form.